From Amazon's website: Mesh Pockets Vinyl Shower Curtain - White (NEW in original packaging) Stuff your stuff into these handy storage pockets in this innovative and practical Mesh Pockets vinyl shower curtain. The seven vinyl mesh pockets are generously sized and attached to the shower curtain; the pockets can be used to store toiletries, cosmetics, cleaning supplies or even toys! 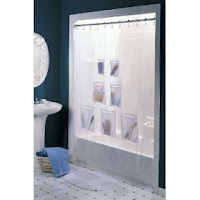 The standard size, 70-by-72 inch shower curtain features a translucent body made of heavy-duty vinyl and white mesh pockets; to clean, simply wipe with a soft sponge and mild soap and hang open to dry. The Mesh Pockets vinyl shower curtain sells for $14.99 in upscale specialty chains and better department stores! One Shower Curtain (70 In. W x 72 In. L) Pocket measurements: 3 bottom pockets each (13 In. W x 12 In. L)2 middle pockets each (10 In. W x 10 In. L)2 top pockets each (7 In. W x 7 In.L) 100% Vinyl with 100% Nylon Mesh PocketsCare: Wipe down with soft sponge and mild soap solution, let hang freely and open to dry. The Mesh Pockets Vinyl Shower Curtain With Pockets, sold by everydayhomeoutlet on Amazon.com is a great solution for storing my kids’ tub toys. While mesh bags are a storage option, I didn’t really like them, because I was the only one that would put the toys back in them. No to mention, they are bulky and don't ever seem to dry. I tried a plastic bin. The tub toys were piled in a bin that sat on the bottom of the tub in everyone’s way. While they were contained, I didn’t find this to be an ideal storage solution. The boys and I had a meeting in which we determined which toys would stay, and which would go. I took the toys that were keepers and put them in the lower pockets of the shower curtain where my youngest could reach them easily. The routine of putting the toys back in their pockets is a way of getting organized that he is happy to help with! No more looking at or stepping on tub toy clutter! The toys aren’t visible, because this curtain acts as the liner and it is hidden by a decorative outer curtain. The pockets can be used to store anything like shampoos, razors, and soaps, not just tub toys! It has been a few months since I put up the mesh pockets vinyl shower curtain and it is definately durable, well made and holding its end of the bargain by holding all those tub toys! Click here to continue to my article that is chock full of tips on How to Clean Up Your Bathroom Clutter! If you are looking at your monthly budget and wondering, where can I save some money? Using grocery coupons in conjunction with in-store sales is a pretty painless way to start saving some serious money. It takes very little of your time. My hygienist warned me that I was brushing my teeth "too hard" and that my upper gums were starting to recede. Receding gums means a loss of gum tissue, which exposes the roots of the teeth (aka gingivial recession). When the gums erode away too much, it can lead to gum disease. Once the gums are gone, they-are-gone. She recommended switching to any type of Sonicare toothbrush. For brushing teeth, this type of toothbrush has "high velocity bristle movement" that results in direct contact with each tooth. According to the manufacturer the, "patented sonic technology delivers a unique dynamic cleaning action for superior plaque reduction." While searching on Amazon.com, I discovered the Sonicare Xtreme e3000 Power Toothbrush. 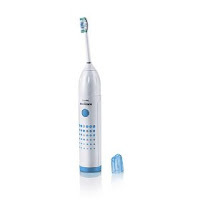 This battery operated Sonicare is $29.99. When comparing prices, this was at the lower end. Some Sonicare toothbrushes were closer to $200. After reading the reviews for the $29.99 Sonicare Xtreme e3000 (battery operated) Power Toothbrush, I made the purchase. The Review- This little Sonicare has a lot of power. The toothbrush does all the work, no need for me to "brush" at all really. I have had it for nine months now and love it. It sure beats paying for a higher priced one that requires a recharging base. The batteries last for at least one month, when using twice a day. I like how portable it is- I took it with me on our trip to Maine and on our camping trips. It is small so it travels well. I noticed many negative reviews regarding how it "short circuits when water gets inside of it." This has not happened to me, and I certainly don't take the best of care to avoid getting water on it. It's inevitable! It's a toothbrush! However, to avoid that happening, try rinsing off and then towel drying your Sonicare after use. This will keep the batteries from getting wet. Or, just lay the toothbrush down on a dry surface so that water does not drip into the battery compartment at the bottom. After using the brush for about five months, my first trip back to see the hygienist for a cleaning went very well. According to her, my "gums look healthy" and there was much less time spent scrapping plaque-which was priceless! For the oral hygenie benefits at such a small investment, I will continue using the Sonicare to brush my teeth! The Miniature EcoAquarium from Wild Creations website: Wild Creation's unique EcoAquariums provide all the benefits of a large aquarium environment in a small, easy to maintain aquarium. They are ideal for homes, offices, schools, and dormitories! Each EcoAquarium is a complete aquatic ecosystem environment that requires no additional chemicals, filters, or aeration. They only need water changed every five or six months using fresh, bottled spring water. Our "Living Gravel", which acts as the natural filtration system for the aquarium, does not need to be cleaned. Each aquarium includes at least one snail, which acts as the janitor to clean the algae and excess food so you don't have to! The African Dwarf Frog from Wild Creations website: As the name suggests, these dwarf frogs are quite small, just around 1.5 inches in length. The females, as is often the case with frogs, can grow a bit larger, almost by half an inch. Native to Sub-Saharan Africa, the African Dwarf Frog (Hymenochiru) also goes by the name of Aquatic Dwarf Frog. And that’s because they live almost entirely underwater, though they are air breathers as well and do emerge from the water from time to time. The coolest thing about the African Dwarf is their weird floating habit when in the water called the “Zen position.” With arms and legs outstretched and one foot balancing, it’s as if these frogs are meditating on some sublime aspect of amphibious life. Or just reminiscing their previous life as a prince. Technically, this habit is called “burbling.” Whatever that means, Dwarf Frogs make for interesting addition to your amphibious pet collection at home. They spice up the variety of species one can put in any tank aquarium. As social creatures they can be tank mates to some marine animals. The Review: My son received this 4" x 4" plastic EcoAquarium for his eighth birthday. He was thrilled! The frogs are active, especially when you move their tank (gently) and interesting to watch. Along with his Dad, my son is allergic to cats and dogs. Getting a hypoallergenic dog is not an option, unfortunately, so "pets" like these little African dwarf frogs in their little EcoAquarium are ideal for our family. Feeding is no problem. These little guys eat two little pellets, twice per week. No chance of overfeeding- just two pellets! Not only do they require very little food, they can live up to 10 days without feeding. So going away for a few days and leaving our new pet frogs "home alone" should be no problem. The company recommends cleaning the tank water every five to six months, using natural spring water and a turkey baster or small scooping cup. Twice a year? We can handle that! Get everything you need to get started with the Classic Water Garden Starter Kit. The package includes the Classic Water Garden, 2 Frogs, 1 Snail, Food and Care Pack, and choice of base for approximately $30. What a great gift idea for someone like my son who is allergic to cats and dogs! This would make a unique gift for any young boy (or girl for that matter). For more information or to order your EcoAquarium, visit http://www.wildcreations.com/. Jane Doiron has adapted her families’ favorite recipes into simple, quick make-ahead meals saving her time, money and stress about what to have for dinner night after night. 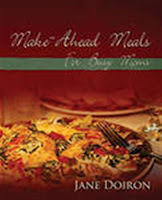 Now her customized recipes are available in her new cookbook, Make-Ahead Meals for Busy Moms, published by Outskirts Press. This awesome cookbook has over 140 great make-ahead recipes! Kristi is a Freelance Writer specializing in online marketing communications. She writes press releases, (like the one in this post)web articles, media kits, brochures, web content and more. Please visit www.kristimaloney.com for more information.